I have been using this Belkin Crock-Pot WeMo Slow Cooker for 6 months and I’m quite happy with its performance so far. It is easy to set up and comes with a clear instruction manual to guide you through the process. I have been using this Belkin Crock-Pot WeMo Slow Cooker for 6 months and I’m quite happy with its performance so far. It is easy to set up and comes with a clear instruction manual to guide you through the process. Some people may argue about its exterior which is made up of plastic, but it’s durable and not that type which can break easily. I adore slow cookers as they prove to be useful in making my life less demanding. 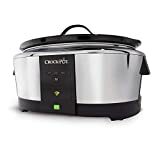 Before I begin to look into the advantages and disadvantages of this slow cooker, I would like to add that there is this little issue in the low, high, and warm settings option of Belkin Crock-Pot WeMo Slow Cooker. There have been a few complaints on the settings from people who have used crock pot that neither the stewing pot nor the WeMo application let you view the real temperature; rather you just have the choice of high, low, or warm. Truth be told, I’ve never seen any slow cooker from any brand that gives you a chance to utilise genuine numerical temperature settings. Saying this doesn’t imply that they don’t exist, yet I think you would be totally unable to discover one. In the beginning people can find it annoying as it has that blinking light which could lead to make less tech savvy people frustrated and eventually return the product. 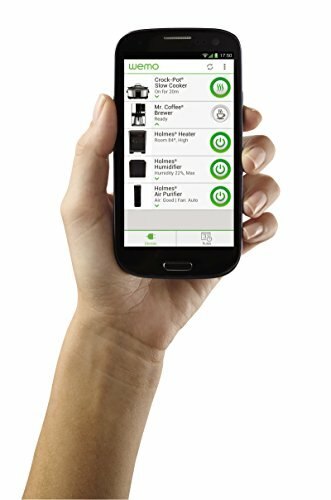 Nonetheless, there are various advantages associated with the product as it has a Wemo app that is completely free that allows you to control the product. Without any Wi-Fi connection needed, you can plug it in and press the front panel buttons. Crock Pot can also be switched on manually with the help of the button in order to regulate the temperature and can be turned off using the app. However, like most of the electronic slow cookers, Crock Pot turns off when the electricity goes out and does not resume cooking when the electricity comes back again. It would have been better if there was a feature which could send alerts to my iPhone and also have the facility to resume cooking once the electricity comes back. The application is exceptionally spontaneous and it is quite easy to take a quick look at the status of your dinner initially. All of my friends who came to my house, straight away noticed fragrance originating from my kitchen, and continued asking about the time dinner will be served. Nonetheless, the smell was different of the aroma that Belkin had sent me at first. When I connected it there was an intense smell of liquefying plastic. But the second time around Crock-Pot I got likewise emitted a weak smell like plastic melting however it was considerably less observable, and was diminished quickly. However, in all honesty, my most loved moderate cooker has a metal “vessel” that permits me to cook the meat on the stove and exchange the “container” directly into the “pot” to slowly cook throughout the day.